Captain Clark was in command of the USS Yorktown (CV-10) in Task Group 58.1 within Fast Carrier Task Force 58 on January 31, 1944 when he received the message promoting him to Rear Admiral. On March 15, 1944 Clark raised his flag in the USS Hornet (CV-12), an Essex class carrier, and on April 13 sailed from Majuro to provide support for General Douglas MacArthur’s planned landing at Hollandia and Aitape on the north coast of New Guniea. At the time of sailing, he was Commander of Task Group 58.1 in Fast Carrier Task Force 58 commanded by Vice Admiral Pete Mitscher. The USS Hornet would be Admiral Clark's flagship until he was detached from Sea Duty on June 16, 1945 following the Okinawa campaign, and the rotation from 5th Fleet to 3rd Fleet that was unique to the Pacific Fleet, and occurred roughly every four-months. 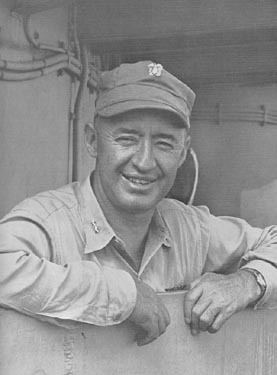 When he reached Leyte and anchored in San Pedro Bay on the 16th, he hauled down his flag in Hornet, and turned over command to Rear Admiral Tommy L. Sprague.